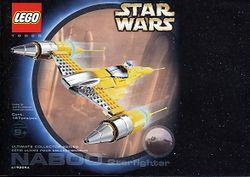 10026 Special Edition Naboo Starfighter is a Star Wars Episode I set released in 2002. It is an Ultimate Collector's Series set, with many parts in the chrome silver colour. It contains a Naboo Starfighter with R2-D2 in it. According to the UCS Promotional Poster, this set retired in 2002, the same year which it was introduced. Facts about "10026 Special Edition Naboo Starfighter"
This page was last edited on 16 January 2019, at 11:04.